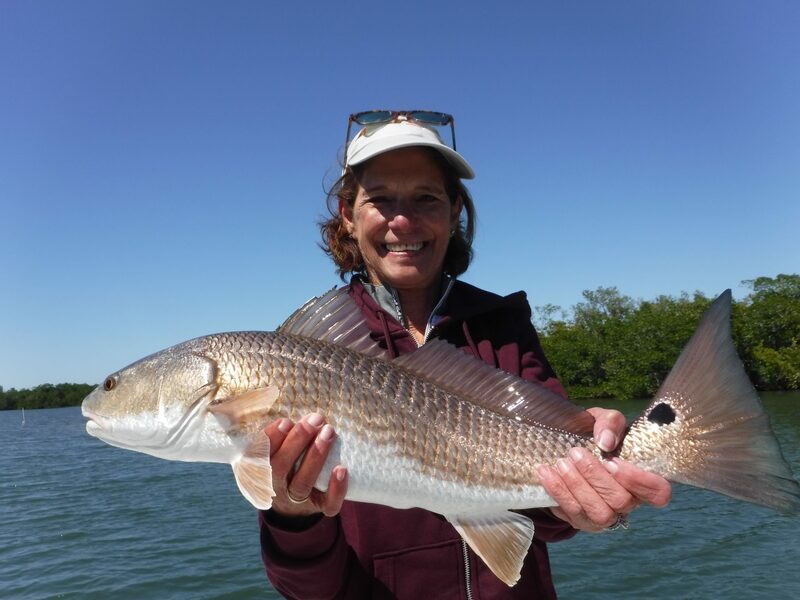 Clients experience great fishing action and variety on the calm waters of Sarasota Bay. Experienced anglers will find the challenge of hooking a trophy snook in a pristine environment appealing. Fly anglers have several options when visiting Sarasota, including river snook, Sarasota Bay & inshore Gulf of Mexico. 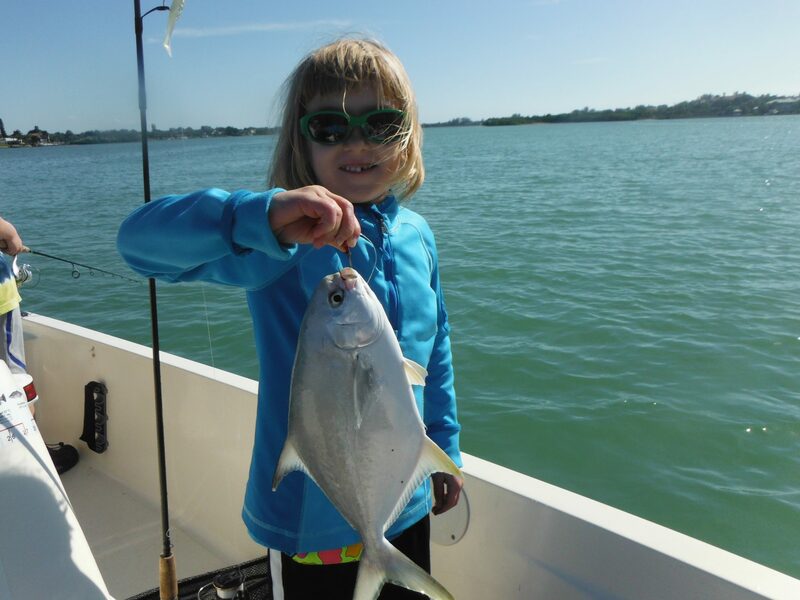 Read current Sarasota fishing reports along with fishing articles and other relevant information. Welcome to Fishing Lido Key! The best way for anglers visiting Lido Key to experience our great action is on a Sarasota fishing charter. Sarasota Bay is a hidden gem in a resort town that lies between Tampa Bay and Charlotte Harbor and offers visitors to this resort city a a unique angling opportunity opportunity. This prime estuary is roughly ten miles long and runs from northwest to southeast. It is a shallow body of water with many acres of lush grass flats that attract gamefish. One exciting aspect of going out on a Sarasota fishing charter is the wide variety of species available and the different techniques that can be used to fool them. 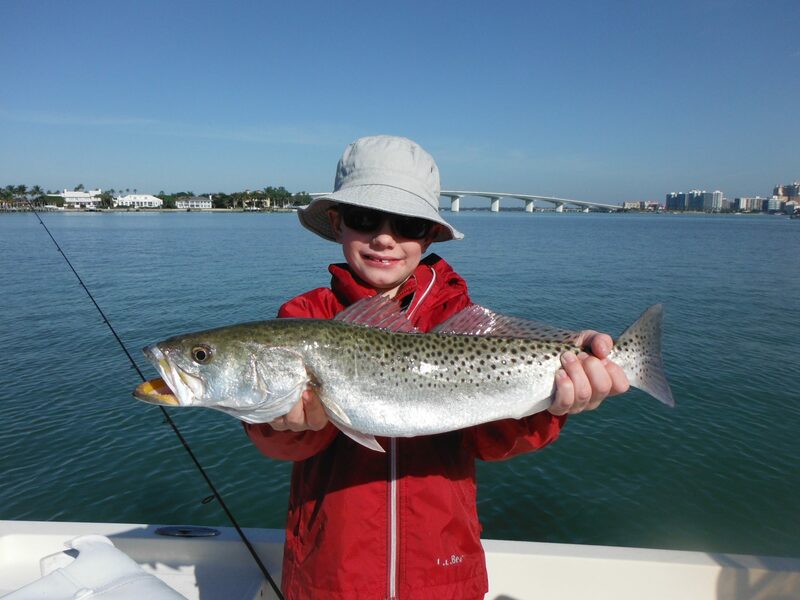 Speckled trout are abundant on the grass flats and are available all year long for anglers booking a Sarasota fishing charter. 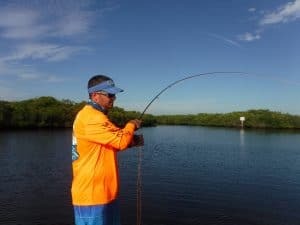 Depending on the time of year and conditions, Spanish mackerel, pompano, bluefish, jack crevelle, mangrove snapper, gag grouper, sharks, ladyfish, and more are caught by anglers casting artificial lures and live bait. Big Sarasota Pass and New Pass connect Sarasota Bay to the Gulf of Mexico and many species use the passes to migrate back and forth. Structure will hold sheepshead, snapper, grouper, snook, anchoring up and fishing with live bait works well. Another productive method is drifting the pass with the current and casting jigs or live bait, which will produce pompano, mackerel, bluefish, ladyfish, and more. These techniques do not require much experience and can be enjoyed by clients of all ages and skill levels. 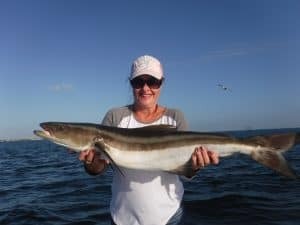 Anglers with more experience who seek a more challenging option on a Sarasota fishing charter will enjoy the thrill of casting lures and bait for snook, redfish, jack crevelle and more along mangrove shorelines and oyster bars. The inshore Gulf of Mexico offers fantastic fishing when conditions are right. Consequently, Spanish and King mackerel, false albacore, sharks, and the mighty tarpon are all available at certain times of year. 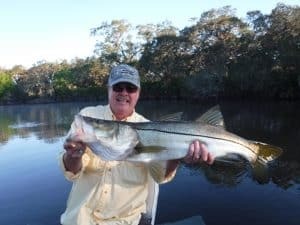 Another option for clients seeking a very unique trip is to visit one of the nearby rivers to fish for snook and largemouth bass. This requires some casting skill and patience, but those efforts are often rewarded with a trophy fish! Capt Jim Klopfer has been a U.S.C.G. Licensed captain in Sarasota since 1991. He is very well-rounded and adapts to the desires and experience level of his clients. He operates his fishing charters on a 2016 22′ Stott Craft bay boat. 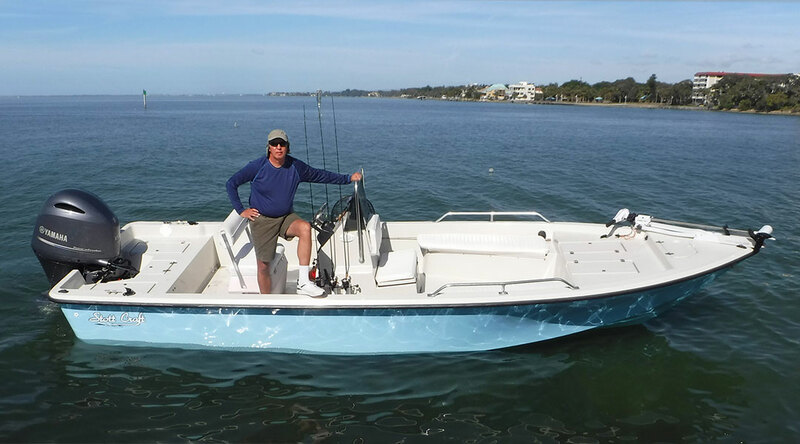 It is roomy, comfortable, and safe; a great boat for fishing Sarasota Bay and the inshore Gulf of Mexico. Capt Jim supplies all tackle, bait, fishing licenses, and a cooler with ice. Clients need only hats, sunglasses and sunscreen, and whatever they want to eat and drink. Catch-and-release is encouraged, but Capt Jim will clean and bag a couple of fish for dinner if desired. Sarasota and her keys are also a VERY “family friendly” destination, allowing the non-anglers in the crowd to enjoy a great vacation as well. The area boasts award-winning Siesta Key beach, great shopping and restaurants in downtown Sarasota and St. Armand’s Key, live theater and music, something for the entire family! Siesta Key Beach has won the prestigious “best beach” award and it world famous for it’s powder-like white sand. This sand is the result of a large quartz deposit offshore. The public beach has a large parking area. To the north is Siesta Key Village which had a lot of shopping and food. Restaurants range from very casual to fine dining. Outside bars are fun with live music and adult beverages. St. Armand’s Circle is quite famous for it’s shopping and restaurants. It attracts visitors from all over the world and is just over the Ringling Bridge from downtown Sarasota. Lido Key has many fine resorts and lodging right on or near the beach. Two nice parks exist at both the north and south end of Lido Key. Downtown Sarasota has grown a lot in the last ten years! Luxury high rise condominiums have sprung up, as well as shopping and a ton of restaurants. Food choices are endless, from casual bars to fine dining. Live music, live theater, and movies are all entertainment options. My brother, his wife and I had a great trip over Thanksgiving week with Capt. Jim. He had us on fish all day and was eager to share his tips and recommendations. Even had a nice Pre-Thanksgiving meal of delicious Pompano. You will have a great time with Capt. Jim and he comes highly recommended. Captian Jim was absolutely amazing! Our fishing adventure was quite that! An adventure! Constant fish biting and he knows the waters well! Plus he has a great sense of humor to sit back and talk with! If I’m in the Longboat Key area again, I will definitely be calling him up. Great time on the water! I took my 12 yr old daughter in her first ocean fishing trip and by the end of the charter she was casting and catching like a pro! Capt. Jim was very patient and gracious enough to teach her how to use spinning gear, something she had not done before, and she got a lot of practice as Capt. Jim had us on fish the entire trip. We caught 10 different species and several of quality size. If you want a great experience ocean fishing you won’t find a better guide than Capt. Jim!